In one of the most vibrant, attractive and desirable locations in any city, anywhere in the world, a new residential tower is set to establish itself as a defining feature of New York’s already iconic cityscape. Due to complete in 2019, 53 West 53rd (also known as 53W53, Tower Verre, MoMA Tower, and Tour de Verre) is expected to both complement the past and redefine the future of Midtown Manhattan, taking its place among to such world-famous sites as Central Park and the Museum of Modern Art itself. The New York Times has called it the most exhilarating addition to the skyline in a generation. Designed by Ateliers Jean Nouvel and architects AAI, the 320 metre supertall skyscraper will be home to more than 140 enviable apartments as well as providing ample new gallery space for exhibitions, linked by a bridge to the existing Museum of Modern Art buildings. The design of the building seems sure to match any of the artistic masterpieces on display. The dramatic aesthetic features a complex, multi-faceted exterior rising and taping to three distinctive asymmetrical peaks at the tip of the tower. All three peaks share an intricate diamond or crystalline form but each one is unique in terms of size and shape. 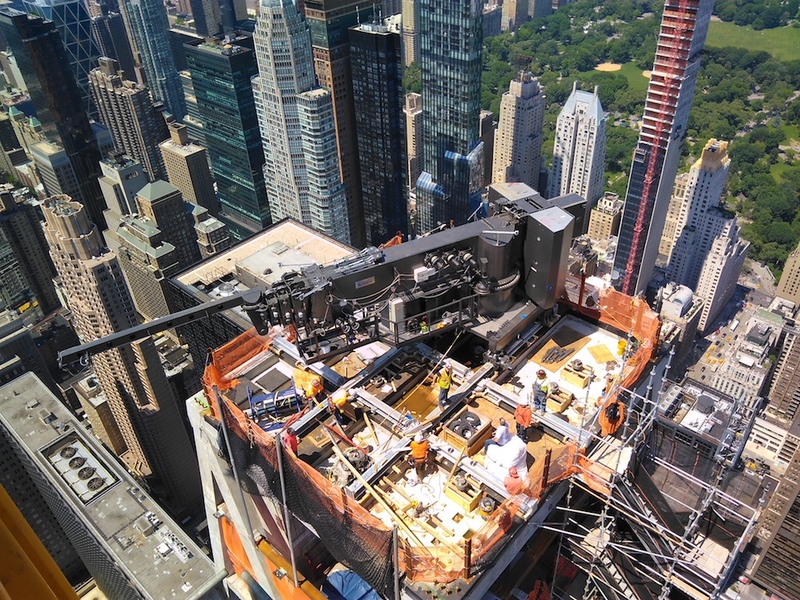 As an emerging icon in one of the most visited parts of a great world city such as New York, effective and reliable building access for cleaning and maintenance tasks was a vital ingredient in ensuring the success of 53 West 53rd as a luxury residential building, as part of an important cultural attraction and as a landmark building in its own right. The project called for a building access system capable of providing access to all areas of the facade while also being entirely hidden from view when not in use. These requirements presented significant challenges in combination with the numerous contours and facets of the building and the irregular, diamond-shaped features at the apex which meant there was extremely limited space available for a roof-based Building Maintenance Unit. CoxGomyl’s expert team was able to overcome these challenges and meet all the clients requirements with a comprehensive building access system made up of two BMUs. The larger machine located at level 76 is capable of holding six operators and offers an outreach of over 36 metres. This is combined with the additional flexibility provided by an articulating crossbar and a moving counterweight which compensates for the considerable wheel loads and allows it to be stored in a small designated parking area. The machine can be launched from behind one of four operable doors which conceal the unit when it is not in use. 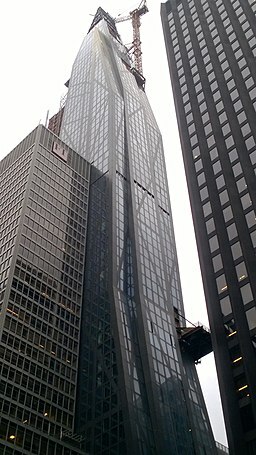 A small BMU covers the area between level 76 and the highest point of the building, including the unique asymmetrical diamond features. This section of the structure required the manoeuvrability of a pantograph system and, like the larger BMU, is also hidden behind operable doors when not in use. From landmark projects such as this to more standard constructions, CoxGomyl can always be relied upon to deliver reliable, cost-effective building access solutions that meet your access needs and are delivered promptly. Contact us to find out how our expert team can help.